Sarsaparilla Extract, 1 fl oz / 30 ml each (Nature's Wonderland) - Penn Herb Co. Ltd.
Sarsaparilla is native to the Caribbean and other tropical regions, where it’s popularly used in performance blends, joint care formulas, as well as external & internal skin care preparations. Find this rejuvenative root in the following fast-acting liquid extract: Adren-Aid Stress blend and Men’s Silver Prostate Formula. 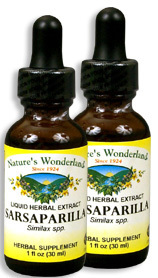 AMOUNT PER SERVING (200mg/ml or 30 drops): Ethically Wild Harvested Sarsaparilla Root (Smilax spp.) OTHER INGREDIENTS: Grain Alcohol (50-60% by volume), Deionized Water. Free of: milk, dairy, egg, fish, shellfish, tree nuts, peanuts, wheat, gluten or soy.